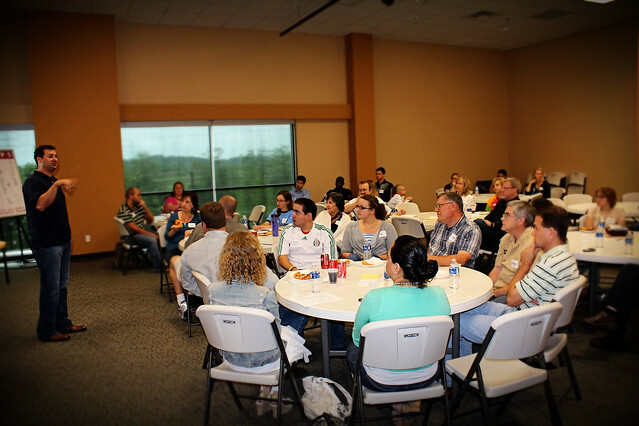 In addition to a filtered pass where we look as individuals for unhelpful emphases on law without context to grace, a filtered pathway through which all curricula under consideration passes, a filtered point that ensures our lessons make explicit gospel-implications in application, Clear Creek Community Church processes children’s curriculum with one final approach: a filtered people. In other words: train your children’s ministry teams in gospel-centrality. For example, last year we gathered all of our children’s workers and devoted an entire evening to understanding the tenets of redemptive-oriented teaching. I was privileged to lead the session and was blown away at the response. Scores of volunteers came to me afterward, not to describe how they thought this gospel-centric approach would impact the kids the ministered to each Sunday, but how it had made a dent in their hearts right now! Some adults were so overcome at seeing the redemptive scope of Scripture and its impact on teaching children the Bible contrasted with the gospel-less moralism they were taught in church as children that they openly wept in speaking with me. Others felt a deep conviction on how they were currently discipling their own children at home. There were pockets of both illumination and repentance dotted throughout the training. Training those in your children’s ministry towards gospel-centeredness equips an entire army of men and women who love children with tools to point those same children to Jesus week after week. It allows you to create a whole force of people who now see the Bible with a gospel-impulse and desire to highlight that impulse each week. It also provides great accountability to the leadership. They become one more “filter” for you and the curriculum you ask them to use. Organizationally speaking, it completes a 360-degree awareness for children’s ministry leaders – from the elders who oversee you to the volunteers you oversee, making sure that everything in your children’s ministry highlights the glorious Person and Work of Jesus. What are you doing to develop your teams in gospel-centrality? Feel free to share your strategy. Maybe we’ll wind up taking an idea here or there from churches who also want to see the gospel central to their ministries. If you don’t know a place to start for training, I know several churches who are using my article as a starting point. I humbly suggest it as a possible starting point for you as well. Wherever you are, my hope is these series of posts challenge you to do something that moves the curriculum you use and the ministries you use them in toward greater clarity with the Good News found in Jesus!